In any organisation, employees are considered as the major. In the success of the organisation, the employees play an effective role and this fact cannot be underestimated. Therefore, ensuring the effectiveness of these unique assets has become imperative through the effective training and development programs for maximising the job performance. It is also imperative for the organisations to make their employees prepare for the challenges that the organisation is facing or might in the competitive environment. A number of researches have although be carried on the human resource management but in the context of UAE, but the case is somewhat different when it comes to the importance of training and development in the UAE and especially in the construction industry (Ford, 2014). It is observed that due to globalisation, changing political environment, technology, and economic environment, organisations are facing increased competition. In the corporate world, it is important to take into account the role of prevailing knowledge and its impact on the working practices, processes and procedures. The growth is not only initiated by the technological improvement nor is it only linked to the combination of factors of production but the improvements in the development of human resource of organisations have played a significant role. Therefore, in every organisation, it is the responsibility of the management to enhance the job performance of individuals through implementing effective and value added training and development programs. This is amongst the major challenges that are faced by the contemporary organisations that are serving in the construction sector. As employees are the crucial resource of an organisation, it is significant to optimise employee’s contribution in meeting the goals and aims in order to maintain effective performance (Lunenburg, 2011). Such continuous changes are prompting the organisations to train their employees in order to make the employees equipped enough to face the said challenges and also to enhance their performance. Performance and productivity are amongst the most significant factors of the construction industry. The performance and productivity of the employees have a significant impact on the performance of the entire organisation whether it is small or large. Almost 8% of the GDP of UAE is generated from the construction industry, therefore; research in this area bears significant importance in the development of the economy. Currently, UAE is undergoing rapid development in all the business sectors and the construction industry under this process is the most prominent one (Harrison, 2011). The success of the construction industry of UAE is highly dependent upon the unique structures of the building and the uniqueness of the processes and policies. The role of labour is significant in the construction of unique buildings like The Dubai Mall and Burj Khalifa. Such structure requires efficiency and proficiency of the workers and another human resource. Since the construction industry is going through continuous change, therefore, in order to sustain and maintain the efficiency of workers, constant training and development are required. The UAE construction industry is a multi-billion dollar industry and thus holds a significant position in the economy. Until the region was not affected by the economic slowdown, the industry was maintained and run by the high liquidity that owns to the high oil prices, stable political condition and the government spending (Jehanzeb & Bashir, 2013). From the Asian countries; the region had continued supply of cheap labours. Since the rapid change in the economic factors worldwide, the construction industry of UAE is continuously affected by a large number of factors that such as different management styles, customs, language barriers, the level of supervision, capability, quality, climate and cultural factors. All the organisations within UAE are hindered by the similar amount of constraints, and the same specifications are applied regularly and therefore, the bottom line is that the performance in the construction industry is influenced by the effective and efficient performance the workers and that methods they use in executing their job roles. Therefore, for all the organisations serving in the construction industry of UAE, achieving quality and quantity of results in the process of controlling the inputs is a key challenge for all the contractors (Panagiotakopoulos, 2011). In the construction industry, the training has a vital role in achieving the goals of the organisation, through incorporating the organisational interest and the interest of the workforce. In the construction industry of UAE, training is the most important factor as training plays a vital role in increasing the effectiveness and efficiency of the employees and the organisation. There are a number of factors on which the performance of the employees depends in the construction industry. But considering all the factors, training and development is the most important factor in the enhancing the performance of the employees. Training in the construction sector enhances employees’ performance. The employees who have more job experience performs perform comparatively better as it increases the competencies and skills of the employees. In the construction industry, training also has an impact on the return on investment on the employees. On the performance of the employees, the performance of the organisation is dependent as the human resource capital is vital for the organisational performance and growth. In order to improve the performance of the organisation, training is provided for the development of the employee regarding their respective area of work. The boom of the construction industry is totally dependent upon the process, standards and policies and the efficient management of money and time. Productivity in the construction industry is important as it has a significant impact on cost objectives and time. Due to the rapid change in the construction industry of UAE, the workers are experiencing certain pressures and are experiencing difficulty in coping with the change. This is causing a significant impact on the performance of the workers and costing time and cost to the organisations. Training and development are thus necessary under such circumstances in order to help the workers to cope with the change and to increase their overall efficiency. This research is aimed at investigating and understating the impact of training and development on the performance of employees that are serving in the construction industry of UAE. The research is specifically designed keeping in view of the construction industry of UAE and the factors that play a greater role in affecting the performance of the construction industry. •	To identify the role of training and development on the job performance of workers in UAE construction industry. •	To highlight how strongly training and development can contribute to the improvement of the job performance of workers in the UAE construction industry. •	To determine obstacles in the UAE construction industry that may prevent training and development from being effective. Training and development within the human resource management can be defined as a function that is concerned with the activity of the organisation that is aimed at improving the performance of the individual and group of employees in the organisational setting. Employee performance is defined as the degree of performance of the workers in executing their job responsibilities and duties. For the purpose of this dissertation, following structure has been followed. This is the first chapter of the dissertation. This chapter is aimed at providing the background for the study and highlighting the aims and objectives. This chapter entails the details of the construction industry of UAE and is aimed at determining the significance of the study. Furthermore, this chapter is also aimed at providing the problem statement that is the main reason which has formed the underlying cause of the research. This chapter provides the literature that is based on the previous researches, that has been conducted by the experts on the research topic. This is the third chapter of the dissertation. This chapter entails the methodology that is undertaken by the researcher, to the research topic. This chapter entails the details of the research design, research philosophy and research approach and the details of sampling and the data collection. This chapter entails the analysis of the results of the data that has been collected. In this chapter, the results are analysed and interpreted in order to draw a conclusion of the research study. This is the last chapter of the dissertation. It includes concluding the entire research, followed by the recommendation on the research or the topic under consideration. This chapter furthermore, limitations of the study and future research options on the subject matter under discussion. This chapter was focused on providing the aims and objective that is underlying the research study under consideration. The next chapter is based on the review of the past studies that are based on this research topic. This chapter is aimed at determining the precedent studies and researches that are available on the topic. It presents theoretical foundation along with empirical justification, literature gap and conceptual framework. Training and development are considered as the imperative part of the human resource management because it has an association with the organisation that are functioning in the world. Aguinis & Kraiger (1996) stated that training and developing is the process of imparting particular abilities, knowledge, and skills that are significant for an employee. It is the means of improving or enhancing the current or future performance of the employee through improving their ability to perform. This is the technique that involves changing the attitude of the employee and increasing their knowledge and skills with respect to organisational need and demand. It is noticed that the need for training and development takes place based on the deficiency of the performance of the employee. Meredith Belbin (2011) argued that training and development are two distinctive concepts which can be used together in order to improve the performance and working of the organisation. Training is known as the process that involves imparting particular skills, while, development is known as the learning opportunity that contributes in letting employee grow. The basic purpose of both is to enhance the job performance by focusing on the activities and performance of the organisation and individual. This demonstrates the fact that training and development are the important concerns that need special consideration from the perspective of the organisation that is not able to meet their criteria. According to Boyatzis (2008), training and development comprise of three different activities such as education, training, and development. Each of the activity has their particular skill and features due to which they are considered as effective by the individuals. The first activity of training emphasises and evaluates the job that is possessed by an individual. Furthermore, the second activity that is education concentrates on the job that person might hold in the future based on their knowledge and ability. At last, development is the training and development activity in which focus is on the actions that are important for improving the functions of the individuals. Sung & Choi (2014) further argued that training and development are the imperative part of the organisational working because it helps the management in letting their employees function in the similar manner that are essential for the achievement of the business goals and targets. Therefore, many of the organisations regardless of their functions and industry make use of training and development procedures to ensure efficient working. It is analysed from the research study of Salas et al (2012) that many of the employees have weakness within their workplace abilities. With the help of a training program, the individual can strengthen their skills because the employees need them to improve their functioning and ability. Through a development program, the employees reach to a higher level in terms of similar knowledge and skills. This contributes in minimising the weak links in the organisation due to which the overall performance is impacted adversely. Moreover, the training contributes in creating a knowledgeable staff in terms of improving the knowledge base of employees so that they can take over one another in terms of need. According to Khan et al (2011), the importance of training and development for the workers can be determined from the fact that it contributes to improving performance. It is noticed that an employee who receives training can perform better as compared to the employee that has not. This is because trained employee gains knowledge with respect to an organisation which helps them in implementing appropriate techniques and processes. Moreover, Hameed & Waheed (2011) stated that training help workers in developing confidence because it provides a stronger understanding of the industry, business, and the responsibilities. This increase in the confidence urges them to perform with increased focus and improves their attitude. It also helps them in creating new ideas that can be used effectively to the success of the organisation. This demonstrates the fact that training and development help employees in improving their position in the organisation. According to Dysvik & Kuvaas (2008), the training and development are considered as important by the employee’s because it also contributes towards their satisfaction. It is analysed that the individual need to make sure they are performing effectively so that they can ask for their promotion and increments. With the help of proper training and development, the employees can increase their satisfaction level in the manner that they would improve the areas in which they are weak. This improvement would ultimately influence their overall performance due to which their reputation in the organisation would enhance. This demonstrates the fact that employee satisfaction is the significant element due to which training and development are considered as important for the workers. According to Anis et al (2011), organisations might smear these diverse approaches to training and development to any number of matters to make sure that the expertise required for numerous places are encouraged. Moreover, organisations gear training and development approaches towards both general and definite expertise, comprise technical working out, sales preparation, communication training, PC training and so on. Furthermore, the core aim of these strategies is for trainees to get new information or expertise in their respected fields. It has been observed from Elnaga & Imran (2013) research that contingent on the finance available and the goals to be accomplished; the time for cross-training might differ from a single day to a whole week or month. However, the particulars should be synchronised with the "receiving" unit head. Moreover, the learner is integrated into the department's operations for the time of the cross-training which includes meetings, demonstrations, or obligations. In addition to this, a more erudite form of cross-training is job replacement, which frequently includes prolonged phases (from 1-6 months). In addition, with job rotation, the worker's role is of a diverse nature and they might not consider as a learner, but is accountable for particular job activities, for which they have to prove themselves. Furthermore, both job rotation and cross-training form a team of employees who are more informed might effortlessly substitute each other when required and who get new self-assurance about their professional proficiency. Additionally, these two approaches direct towards the great enthusiasm all the way through the company. •	Change management: Training assists to cope with change by enhancing the comprehending and participation of workers in the change procedure and also offers the expertise and capabilities required to adjust to different circumstances. Moreover, it also helps to enhance the accessibility and quality of workers. According to Gruman & Saks (2011) people often learn from their working practice as compared to academic understanding. Moreover, the job training decreases expenses and saves time and it is important for the organisations to offer their worker's job training for the reason that it supports them to save their time and cost. Furthermore, it is effective for different construction businesses to offer their employee's job training so that their workers gain knowledge in a useful way. In addition, the style of delivery is a crucial part of training and development and workers are quite aware regarding the delivery style. However, if somebody is not providing the training in an inspiring way and he\she is not catching the attention of the audience that means he\she is unable to make it effective for them. For this reason, it is vital for a trainer to involve its addressees all the way through the training session. Chiang & Hsieh (2012) stated that the delivery style means so much in the process of effective training and development. Additionally, it is hard for a worker particularly in the construction industry to perform their part viably at the field deprived of any pre-training because construction working requires an extra bit of skills and expertise to manage work effectively. Van Iddekinge et al (2009) stated that it is important for any construction firm to provide its workers training to accomplish their strategic goals and targets consistently. Moreover, training and development enhance the overall performance of the firm even though it is expensive to provide training to the workers but in the long run, it returns back more than it acquired. However, every construction organisation must develop its workers as per the requirement of that time so that they might contest with their competitors. In addition to this, it is imperative for an organisation to arrange and design different training sessions quite carefully for the reason that the design must be as per the requirements of the workers. Furthermore, those firms which create a good training design as per the core requirements of their workers and organisation always get an optimistic result. It is noted that the training & development improves the worker's performance like Wilkin (2001) stated in his research that it is an imperative activity to upsurge the performance of employees particularly that are working in the construction business. Suliman & Kathairi (2012) stated that employee performance is one of the vital element and the constructing block which urges the enactment of overall performance. In addition, the employee performance hinges on numerous elements like knowledge and management, job satisfaction, and management but there is a strong link between employee training and performance. However, this illustrates that employee performance is quite vital for the enactment of the organisation and the training & and development is valuable for the workers to enhance its performance. Therefore the basic aim of this considered research is to depict the role of training & development on the job performance of workers. According to Druker et al (1996), it is quite a vital for an organisation to design the training quite cautiously. Furthermore, the design of the training must be as per the requirements of the workers. Additionally, those businesses which formulate a good training design by considering the need of their workers then they always get a positive outcome. In addition, it gives the impression that training plays a crucial part in the worker as well as organisational performance and an inappropriate training design always give negative results. Dysvik & Kuvaas (2008) stated that importance for the money particularly in construction tasks comprises finishing the task timely, within financial budget and to a level of quality that fulfils the customer and ends user requirements. Moreover, getting it properly refers better public facilities, provided more cheaply and viably. However, accomplishing this purpose depend merely on the excellence of the workers intricate at the predesign, design and construction phase. In addition, the core purpose of training and development is to eradicate performance deficits that affect the completion of a project in a negative manner. It is noted that most of the firms face the challenge of evolving better self-assurance, ingenuity, solutions-finding, and problem-solving skills among their individuals. According to Van Iddekinge et al (2009), employees these days should have access to continual working out of all kinds just to hold onto up. For this reason, it is important for the success of construction business that their employees must play an imperative part in the process of accomplishing the stated goals and targets in a consistent manner. It is found that organisations need employees at all stages to be more self-sufficient, imaginative, resourceful and self-directed. Moreover, this attitude allows staff to work at the top level, which makes their firm more competitive and productive. In addition, the competency of workers and their development all the way through education and training are imperative elements in recognising the long-term success of a business. Furthermore, if an organisation hires and keeps competent workers then it is a worthy approach to investing adequate amount of resources in the expansion of their expertise, so they might upsurge their efficiency (Anis et al., 2011). However, when individuals develop self-confidence, reliability, expressively, they spontaneously turn out to be more active, solutions-focused, quick to respond and others. Gruman & Saks (2011) stated that training is considered as the controls on which most of the organisations rotate, of which its inadequacy might lead, not simply to the loss of productivity and creditworthiness but also, the goodwill of the firm. In addition to this, training is a prearranged and organised exertion intended at enhancing existing and future enactment of a work by raising his expertise and understanding. Additionally, training is the procedure whereby workers learn the knowledge, expertise, assertiveness and behaviours essential to execute their part viably. According to Aguinis & Kraiger (2009), training and development refer to approach or plan that is intended to assist new workers in order to adjust into the workplace effectively. Moreover, they comprise the recognised on-going exertions of companies and other firms to enhance the enactment and self-fulfilment of their workers all the way through an assortment of approaches and programs. It is noticed that in the contemporary place of work, these exertions have taken on a comprehensive range of presentations, from training in extremely definite job skills to long-term professional growth, and are appropriate for all types of workers extending from line employees to the CEO. Furthermore, training and development have appeared as recognised business functions, essential factors of corporate approach, and are familiar with works with diverse models and approaches as organisations gradually recognise the major significance of employee growth and expansion, as well as the requirement of extremely expert personnel, in order to enhance the accomplishment and effectiveness of their firms. However, for the greatest part, training and development are utilised collectively to bring regarding the overall acclimation, enhancement, and edification of an organisation's workers. Whereas closely associated, there are imperative dissimilarities between the terms and the probability of each (Aguinis & Kraiger, 2009; Chiang & Hsieh, 2012). Elnaga & Imran (2013) stated that different training programs have quite particular and measurable objectives, for instance working a specific part of the machinery, comprehending a particular procedure, or executing definite procedures with great exactness. However, the developmental programs focus on the extensive expertise that is appropriate to an extensive diversity of conditions, for instance, goal setting, leadership expertise, and decision-making. It is found that training programs are usually tangled to a specific subject problem and are appropriate to that subject merely, whereas developmental programs concentrate on enlightening and moving broader expertise valuable in various settings. Aguinis & Kraiger (2009) highlighted the fact that the population in UAE is low as compared to other countries due to which reliance is more on the foreign workers, especially in the construction industry. It is noticed that 90% of the labour force in the UAE construction industry is based on foreign workers. The total labour in the UAE is more than 3.3 million but the majority of them are foreigners particularly from the Asian countries. Therefore, at the time of implementing training and development procedures or sessions, the management of the construction organisation has to make sure that they are utilising appropriate cross-cultural techniques to train and develop employees. According to Hameed & Waheed (2011), it is noticed that due to a wide range of foreign workers in the construction industry of UAE, the organisation also has to face problem in terms of employee resistance. Many of the workers deny taking the training and development sessions due to the difference in the learning environment based on their cultural background. However, most of the time employees are not ready to accept change in their attitude and working criteria due to which implementation of training and development becomes a tough task for the construction organisation. Chiang & Hsieh (2012) argued that it is highly imperative for the organisations in the construction industry to make sure that there is a proper connection between their processes and amendments. The major obstacle that is faced in the process of implementing training and development in the construction industry of UAE is to ensure that there is alignment between business need and programs. Without proper alignment, the training and development sessions cannot be completed effectively. Based on the discussion made, it is noticed that the literature gap exists in the form of specific data with respect to the construction industry of UAE. There is limited information available from the perspective of UAE construction industry in relation to training and development. Although a lot of information is present for training and development but not sufficient details are presented in terms of UAE construction industry. Another gap in the literature is that there are not UAE researches about the training and development; therefore, this study will help in gaining appropriate understanding about the training and development in the construction industry through specific information. It is noticed that training and development are imperative topic from the perspective of the organisation and much information is available but specific information with respect to the construction industry of UAE is not provided. The chapter has provided relevant detail with respect to the impact of training and development on employee performance. The methodology is an important part of the dissertation. The methodology provides an insight to the writer about the approaches and the procedures that the researcher is going p incorporate in this research study. Methodology chapter is aimed at proving the broader approaches for the adoption of the appropriate philosophy and also includes the selection of the appropriate qualitative and quantitative methods for collecting the data and further conducting the analysis on the later stages (Flick, 2011). Research methodology provides a wider approach about the overall methodology that the researcher is going to utilise during the research work. Appropriate research mythology facilitates in achieving the objectives and goals of the research in a better manner. This chapter is aimed at providing the research deign, research population, sampling strategy, a method for collecting the data that has been used in the research study under consideration. This chapter has entailed the research methodology that is adopted by the research in detail. Research philosophy sets the path of the research as well as chooses the phenomenon that is utilised to gather the data and inspect it in further phases. It supports in distinguishing and accepting the way of data that is said to be as restricted to the epistemology or doxology which means the info that is acknowledged is factual and it encompasses a number of philosophies which can direct the research (Bhattacharyya, 2006). Each and every study is performed on the basis of a fundamental philosophy that controls the approach to the study taken by the scholar all over the project. There are different kinds of research philosophies which are commonly assumed which comprise positivism, pragmatism, interpretivism and realism. For this research, positivism has been considered. It is the research philosophy which considers that reality can be precisely observed, measured, and quantified by an observer, and on the basis of the results of this observation, valid conclusions and reasoning can be drawn. In the present research ponder, the essential point is to comprehend the courses in which preparing and improvement can influence the execution of workers in the UAE construction industry. In order to discover this, the most suitable research philosophy is positivism, as the interpretation of data has been conducted through qualitative observations and quantitative measurements of the relevant variables relating to the problem being considered. For the present research, realist and interpretive philosophies are avoided. This is because interpretivism puts heavy emphasis on interpretation and considers it to be a subjective analysis. However, it is my belief that objectivity can be achieved to a high degree with the use of quantitative tools of analysis, and this philosophy is encapsulated by positivism. Realism is avoided because it believes that only a part of reality can be observed by the researcher, and not all the relevant information can be incorporated in the investigation and analysis of a given phenomenon (Flick, 2011). While this assessment holds merit, the problem can be simplified by making suitable assumptions to disregard those pieces of information and variables which are not expected to affect the problem area in any significant way, allowing the researcher to consider all the important variables and their effects directly on the problem under consideration. For these purposes, a positivist philosophy for this research has been adopted. Pragmatism consent the theories that can be applied if the theories support the actions that underline the research study. Pragmatism is focused on the number of dissimilar techniques that can be used to understanding the world and making sense of it and hence towards completing the research. This also entails that the realisation that opinion and perspective can be different from one and they likewise has the tendency to provide the description that is complete and comprehensive in a number of realistic situation (Lapan et al., 2011). Inductive and deductive approaches are the commonly utilised research approaches while carrying out the research. These are frequently adopted by researchers and the inductive approach is suitable when the researcher aims to develop a new framework or theory under which to clarify a given issue or issue. Be that as it may, since the point of this examination is just to decide the impacts of preparing and improvement on representative execution, a deductive approach has sufficed. The research questions presented in the introduction are, therefore, be considered with a deductive approach to the problem (Scruggs & Mastropieri, 2006). This study utilises both qualitative as well as quantitative methods, thus this research is carried out by using the mixed method. There are a number of reasons why mixed methods are used, including the feeling that a research question can be better addressed. The data has been collected through survey questionnaires and interviews from the participants of this study. The questionnaires were handed out to workers employed in the construction industry of the UAE. The interviews were conducted with HR managers in the construction industry. All research in the academic areas of studies resorts to data obtained from two kinds of sources: primary and secondary sources of data. To give the study satisfactory levels of completeness, reliability, and validity, it is important to incorporate and consider data from both these main sources (Bhattacharyya, 2006). Secondary data consists of a material which has been published by other authors, researchers, and authoritative bodies. This usually involves research publications, case studies, news articles, journal articles, magazines, books, internet sources etc. Secondary data is important because, in order to familiarise oneself with a specific area or subject of study, a good awareness and knowledge of the main concepts, theories, and facts relating to it are necessary to produce a good quality research. Without having known the results and findings reached by other authors in the fields under consideration, it is not possible for any aspiring researcher to undertake and produce sound and accurate research. Therefore, secondary sources of data were given due consideration throughout the course of this study (Kothari, 2011). Primary data refers to those sources of data which are directly acquired by the researcher himself or herself. If a researcher persists with only secondary data, then nothing new can be deduced about any subject. It is through primary data that researchers can open new doors of investigation and offer new insights and obtain new findings. Primary data is a prerequisite for any original research. For the present research, the primary data has been obtained, as has been explained above, through questionnaires and interviews held with multiple participants. This data is examined and analysed to find patterns to be interpreted for addressing the research questions presented above (Kumar & Phrommathed, 2005). In this research, the questionnaire has been prepared for 10 close ended questions and five-point Likert scale has been used to analyse the responses. In addition, the interviews are also conducted. The validity of the study, as well as the conclusions reached, was thus safeguarded by concentrating on the objectivity that is endorsed by the positivist method carried out within this research. Utilising statistical as well as scientific tools of analysis, the validity of the research has been attained to satisfactory levels. Since the study is established upon the work of numerous different scholars who have concentrated this range already, the dependability of the present review is kept up to a decent level. Utilising the work of different scholars to comprehend the issues being considered in this examination and performing a further investigation and data gathering of my own, the research has been made sensibly reliable (Hennink et al., 2010). Sampling techniques are usually categorised as non-probabilistic sampling and probabilistic sampling. Moreover, for the determinations of this study, the non-probabilistic technique of convenience technique is utilised. The sample size of the target population is of 160 employees from the construction industry within the UAE having shaped the sample size for this research. Additionally, interviews have been conducted with 6 managers and coaches to comprehend from their perspective the significance of training and growth on the performance of workers. Sampling is recognised as the most significant parts of the research design. This is because the sample is thought to characterise a huge population, it should be picked prudently. Convenience sampling is utilised in this research since it permits a comparatively great number of contestants to fill questionnaires in less time. There are two data analysis methods which are qualitative and quantitative which are selected after evaluating the purpose and need of the study. Qualitative is the analysis method in which the researcher relies on only contents or textual information such as case studies, interview, and others in order to present findings (Bhattacharyya, 2006). While on the other hand, quantitative is the analysis technique in which the researcher utilises statistical approaches for evaluating the numerical information collected. In this considered research study, the researcher has made use of both qualitative and quantitative analysis method because qualitative method helps in collecting a wide range of data and quantitative is used since it is gathering information from the participants in the numeric format. 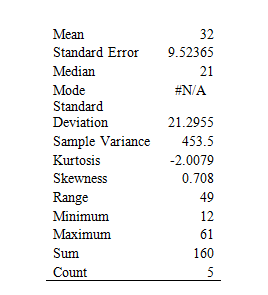 Moreover, under quantitative data analysis technique, the researcher did descriptive statistics using Ms Excel. The findings are provided in the form of tables and charts which are prepared using Ms Excel. 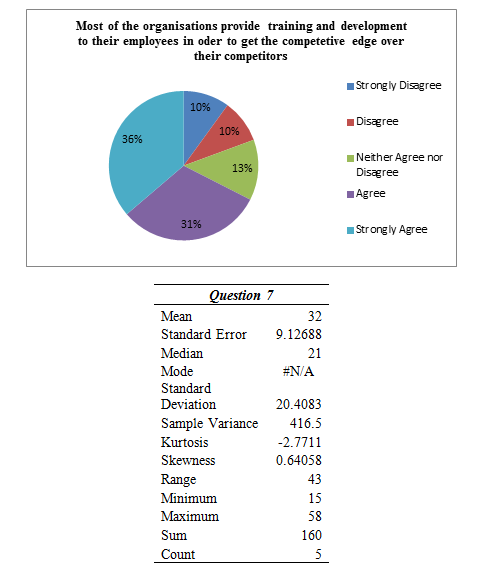 The pie charts are made to demonstrate the responses of the participants (Kothari, 2011). This is the ethical consideration which is utilised in the research study that makes use of primary data collection. For the purpose of this, the researcher has to ensure confidentiality in the manner that it involves gathering information from the participants. The researcher has ensured that none of the information of the individuals is disclosed in front of anyone and complete privacy of all the data is maintained. The researcher has also ensured that the information is used just for academic purpose and once the need is achieved, the data is removed. Maintaining confidentiality is one of the important ethical considerations that have been followed (Maruster, 2013). Maintain anonymity is also the essential consideration with respect to research study because it involves removing the name of the contributor so that data is regarded as anonymous. The researcher needs to provide anonymity of the information which is gathered from the participants as it means that the project has not gathered identified information of the participants such as address, name and others, or the project cannot associate individual responses with identities of the participants. By maintaining anonymity, the researcher has ensured the privacy of the respondents and others (Hennink et al., 2010). The focus of this chapter has been on information regarding the methods that has been employed in the study process. From this chapter, it is clear that the study has been based on a mixed method. The methodology involved in the study involved the use of quantitative and qualitative research methods. This has ensured that the study not only provides facts regarding the phenomena under study but also that the collected information can be easily interpreted using a convenience sampling. By analysing response from 160 employees and 6 managers, the outcome of the study has been enhanced. Primary information is collected through the use of questionnaires and interviews. Secondary information is gathered from different sources such as from the preceding studies. This chapter has also provided an overview of ethics framework that has been observed in this study. Through the application of ethical research, the reliability of the research process outcome is enhanced. At the same time, the section has provided justifications as to why various methods were employed in this study process. In overall, the section on methodology provides a guideline on the overall methods that has been employed in analyses of data regarding the phenomena in question. It is through the application of reliable methods that the collected data is effectively analysed in an effort to answer the research question. . The survey was conducted by the employees working in the UAE construction industry. The analysis of their responses is presented below along with the interpretation in order to evaluate the research aim. 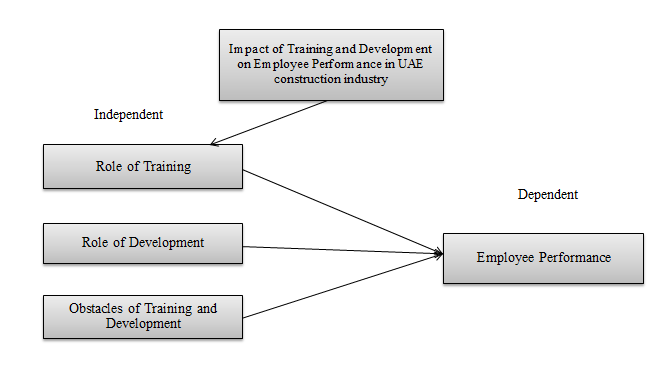 The figure 1 above shows that many of the employees in the UAE construction industry believe that training and development have a massive impact on their performance. From the total participants, 34% strongly agreed, 31% agreed, 16% neither agreed nor disagreed, 9% disagreed, and 10% strongly disagreed with the fact that training and development have an impact on the employee performance. Moreover, the descriptive statistics table demonstrates that the data is spread out widely and less reliable because of the high deviation between mean and standard deviation. However, the analysis demonstrates that employees in the construction industry of UAE believe that they should make use of training and development to improve their performance. The figure 2 above shows that majority of the individuals working in the construction industry of UAE are of the perspective that effective training and development would improve their performance viably. 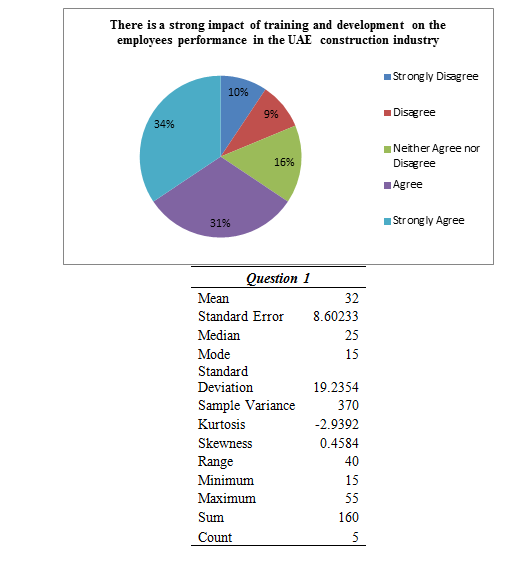 The pie chart demonstrates that from 160 participants, 34% strongly agreed, 38% agreed, 12% neither agreed nor disagreed, 10% disagreed, and 6% strongly disagreed with the fact that in terms of the construction industry, effective training and development would contribute towards improved employee performance. Furthermore, with the help of descriptive analysis shown in the table, it has been evaluated that data is less reliable and is widely spread out due to the fact that standard deviation and mean difference is high. Therefore, the analysis demonstrates positive opinion of the employees about training and development process in the construction industry of UAE. 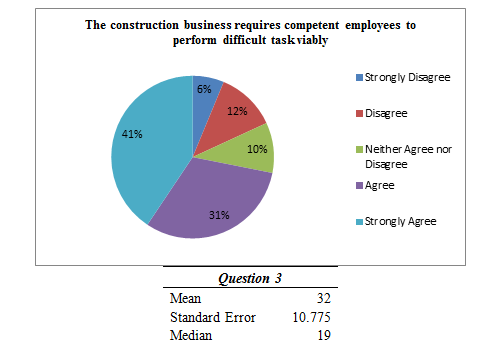 The figure 3 above shows that many of the employees in the UAE construction industry believe that the construction business requires competent employees to perform difficult task viably. The pie chart illustrates that 41% strongly agreed, 31% agreed, 10% neither agreed nor disagreed, 12% disagreed, 6% strongly disagreed with the statement. Moreover, based on the descriptive statistics table provided above, it has been noticed that the data is spread out widely and less reliable. This is due to the fact that difference between standard deviation and mean value is high. Therefore, the analysis shows that hiring competent employees are the need of construction industry and through training and development this need can be fulfilled effectively. 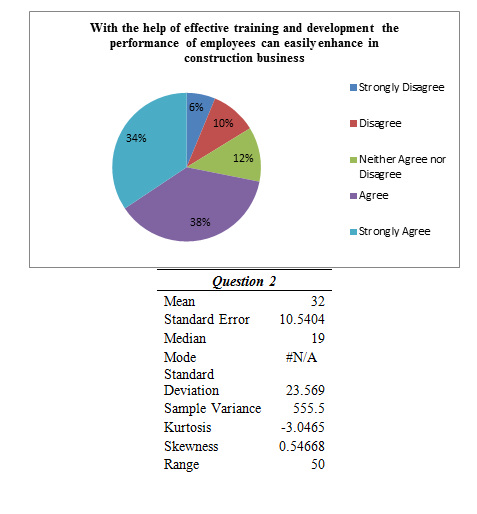 Based on figure 4 presented above, it is analysed that majority of the respondents are from the perspective that it is a core responsibility of the higher officials of construction business to provide all sorts of training to their employees in order to improve their performance effectively. This is supported by the fact that pie chart shows that from 160 participants, 38% strongly agreed, 30% agreed, 13% neither agreed nor disagreed, 11% disagreed, 8% strongly disagreed with the statement. 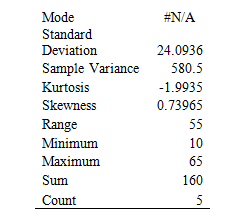 Furthermore, the descriptive statistics table provided above illustrates the fact that data is less reliable and is widely spread because there is the high difference in the values of mean and standard deviation. This depicts the fact that higher officials in the construction organisation must provide appropriate training to the employees so that their performance is improved to the utmost level. The figure 5 provided above demonstrates the fact that from the total participants many of the employees are of the opinion that with the assistance of proper training and development construction firms can easily enhance the productivity of their workers to the greatest level. Furthermore, the pie chart illustrates that 41% strongly agreed, 29% agreed, 16% neither agreed nor disagreed, 6% disagreed, and 8% of the participants strongly disagreed with the statement. In addition to this, the descriptive analysis table presents that the data is less reliable and widely spread out due to the fact that means and standard deviation difference is significantly high. Therefore, based on this, it is evaluated that in order to enhance the productivity of workers, the construction organisations need to implement effective training and development strategies. It is noticed from the figure 6 given that majority of the employees working in the construction industry of the UAE are of the perspective that training and development contribute massively towards the improvement of the job performance of workers in the UAE construction industry. Moreover, the pie chart demonstrates that 37% of the respondents strongly agreed, 29% agreed, 14% neither agreed nor disagreed, 13% disagreed, and 7% of the participants strongly disagreed with this fact. Furthermore, with the help of descriptive analysis, it is evaluated that data is less reliable and spread out because of high variation in the values of mean and standard deviation. Therefore, it is evaluated that employees believe that with the help of proper training and development they can improve their job performance. The figure 7 above shows that many of the respondents are of the perspective that most of the organisations provide training and development to their employees in order to get the competitive edge over their competitors. This is supported from the responses shown in the pie chart above which shows that 36% of the respondents strongly agreed, 31% agreed, 13% neither agreed nor disagreed, 10% disagreed, and 10% of the participants strongly disagreed with this fact. Furthermore, the table of descriptive statistics table demonstrates the fact that data is regarded as less reliable and widely spread because the difference in the value of mean and standard deviation is high. Based on this, it is evaluated that construction organisations make use of training and development in order to gain competitive advantage. The figure 8 above shows that from the total participants many of them believe that there are certain obstacles in UAE construction industry that might prevent training and development from being effective. It is noticed from the pie chart that 31% strongly agreed, 30% agreed, 18% neither agreed nor disagreed, 12% disagreed, and 9% strongly disagreed with this statement. In addition to this, with the help of descriptive statistics table demonstrated above, it is noticed that there is high deviation in the values of mean and deviation due to which the data is regarded as less reliable and widely spread. This analysis demonstrates the fact that there are various obstacles that need to be focused at the time of implementing training and development in the construction industry. It is noticed from the figure 9 above that many of the employees in the construction industry of UAE are of the perspective that diverse background and cultural differences might create problems for organisations to make training more effective. With the help of pie chart, it is evaluated that 32% strongly agreed, 33% agreed, 18% neither agreed nor disagreed, 12% disagreed, and 5% strongly disagreed with the fact. Furthermore, the descriptive statistics analysis in the above table shows that the data is less reliable and widely spread out because there is high difference in the values of mean and deviation. Therefore, it is essential for the management in construction industry to focus on diverse background and culture when implementing training and development. The figure 10 above that majority of the participants believe that Due to the lack of alignment of the process with the business needs, it create problems for them to get sufficient support in terms of training and development. With the help of pie chart, it is evaluated that 31% strongly agreed, 35% agreed, 18% neither agreed nor disagreed, 9% disagreed, and 7% strongly disagreed with the fact. In addition to this, the descriptive statistics analysis demonstrates the fact that data is less reliable and spread out widely due to the fact that standard deviation and mean difference is high. Therefore, the construction organisations need to focus on the alignment of the business needs. . The rapid economic and social development of UAE, particularly in the last two decades has paced the development process of the organisation that is operating in the construction sector. The construction sector of UAE has witnessed significant development especially in the last two decades. Training and development in the construction has therefore initiated the training and development program in order ensure the industry’s success. The study has concluded that training and development in the UAE in the construction industry is now following the footsteps of the training and development practices as is applied in the other countries. This means that organisations that are working in the training and development sector are much focused on the same training and development strategies as are used in other developed countries for improving the overall performance of the workforce. The study concludes that since the organisation in the construction industry are using the similar training and development techniques, the performance in the construction industry is improving due to the upgraded techniques has been used in the construction sector. This research study also concluded that although there are established training and development practices in UAE, but as compared to the other parts of the world, the corporate culture of UAE, put less emphasis on the training and development area. The contribution of construction sector in the UAE economy and the overall growth of the economy require the construction industries of UAE to have broader vision when it comes to the policies and procedures regarding the need for training and development and the implementation of the said policies. The research also concluded that, since the corporate sector is largely operated by the joint families and conglomerates, the owners and managers of UAE that are serving in the construction sector are required to take open minded and broader approach and should depict progressive attitude regarding the training and development of the workers. The study furthermore, concluded that the training and development professionals within the UAE are operating in a culture that is unique along with a different kind of economic situation. Within the UAE it is the matter of common understanding that the corporate decisions are also inflicted with the cultural, moral and religious values. Therefore, the training and development professionals within the UAE are required to fully understand the culture and social environment which is underlying the construction sector, in order to avoid any kind of shortcomings and committing offenses whilst training and development activities. The training and development professionals within the UAE are therefore required to comply with all the legal requirements in order to maximize the effectiveness, efficiency and productivity of the workforce. The research study also concluded that training and development has positive effect on the performance of the organisation that are serving in the construction sector of UAE. The research study has concluded that the training design in the construction significantly impacts on the performance of the organisation. On the job training in the construction industry furthermore, helps in improving the overall performance of the construction sector. The way of delivering the training programs also significantly helps in the enhancing the overall performance of the organisation. As per the research, it is also depicted that the on the job training in the construction industry is significantly influenced by the training design and delivery style and it plays vital role in enhancing the overall performance of the employees and the organsaitions and therefore affect the organisation performance. 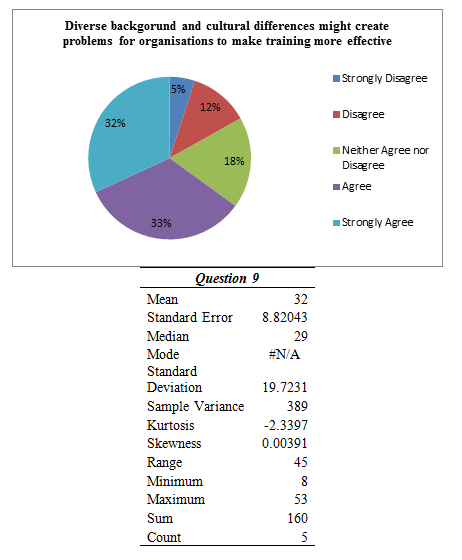 For the purpose of this research study, qualitative and quantitative data analysis technique was utilized to explore in depth the analysis of the questionnaire and the interviews. 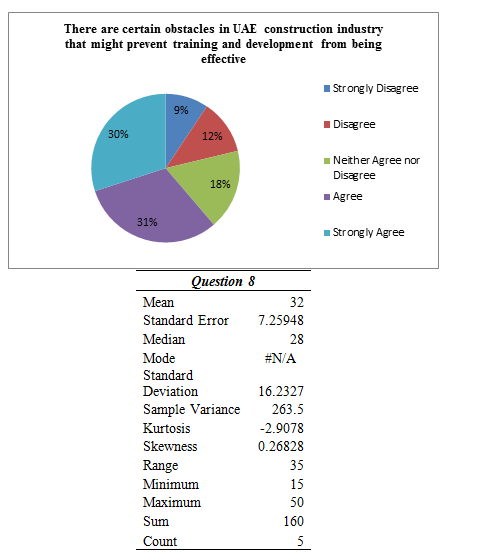 For the interviews, qualitative data analysis technique was utilized and for the questionnaires, quantitative data analysis techniques was utilised. Excel was used to analyse the results of the questionnaire. The results concluded that, training and development has significant impact on the performance of the employees. The results also concluded that within the construction industry, the roles and responsibilities of the job must be clearly defined in order to clearly define the competencies that are required by the construction organisation. The study furthermore, concluded that the clear and defined competency framework helps in evaluating the right set of competencies that is required by the construction organisation and also helps in designing the relevant training and development programs. Moreover, the study concluded that training effective program for employee training and development in the construction sector is vital for the long term success of employees and for the organisation. Training and development can provide an organisation the techniques to sustain their position in the market and to gain competitive edge in the market. Training and development provides a number of benefits to the organisation that operating their business in the construction sector. However, training and development programs are effective only when they are carefully planned and are designed as per the need of the organisation and that can bridge the competency gap within the organisation. Training should be provided and designed with the specific end goal to develop the skills of the employees in order make the employee fit for the job and eventually in the longterm success of organisation. The research study has covered the training and development in the construction industry with the vintage view. Although this research has outlined the cost that is incurred in the training and development in the construction sector but it should be noted that the impact of the training and development is far more as compared to its disadvantages. After conducting the in-depth analysis , it is recommended that in order to enhance the performance in the construction sector, the construction industry should hire trained and expert consultants that can train the employees as per their development needs. In order to identify the need for training and development in the organisations serving in the construction sector, the below mentioned changes and issues may indicate the need for training and development of employees. In order to create the culture of training and development within the organisation, the top management of the organisation should create learning culture that can support the learning within the organisation. The top management should incorporate within their culture that learning is an ongoing process and not a onetime event. It means that the top management should support the training and development framework which constitutes on the job training, near the job training and along with the formal training. The top management should provide learning opportunity on the events to the employees who express their interest in learning. The top management should provide complete support the employees who show increased interest in the learning and development. The top management should reserve the annual budget training and development process. Organisational policies regarding the training and development motivates the employees towards learning and improving their weak areas and helps in cultivating the learning culture within an organisation. The top management should ensure that opportunities should be provided to all the people that are serving in the organisation. The learning opportunity should be provided to the all the individuals of an organisation from the Board of Directors to the individuals on junior levels. The risk areas should be identified in the process of training and development and the shortcomings in this context should be addressed. Moreover, failure should be considered as the critical factor in the learning process and should be addressed by the concerned authorities of organisation from the individual context role, individual potential, and in the context of anticipated competency need of organisation. The organisation should furthermore take the approach of learning from failure, and should continue to develop, and should try not to become reluctant on any mistake. The organsiation should furthermore, focus on the development of workers in case of failure except for punishing them. the leaders within the construction industry of UAE should furthermore, develop the culture that encourages the employees to develop and to encourage the people for taking risk and be creative in trying out new things and should provide them with the facilities that can encourage the employees to grow and to succeed. The companies should furthermore provide the time to employees for learning in the workplace and should support such learning practices. Such type of practices and values is important for the success of employees and the relevant development program. This imply that the employees should be provided time for learning without any interruption of everyday activities. Learner is not limited to the one time process but is an ongoing process. The organisation after providing training and development should ensure that the learning that is provided to employees should provide opportunities for the employees to ensure on the job training and in ensuring that people should retain what they have learned throughout the learning and training session. The effective training and development program in the construction sector can result in the ultimate benefits for the organisation. Moreover, effective training and development programs results in enhancing the overall performance of the employees and of the organisations as whole. The main limitation of the study is that, the study is conducted on small sample size that restricted the scope of the study to be applicable on the larger scale. The limited sample has provided insight about a few organisations has restricted to discover more about the training and development practices in the construction industry of UAE. The time was limited for this proposed study which also proved to be the hurdle for investigating the subject matter and has further limited the scope of the study. The study has furthermore based on the interviews from the managers due to the time and resource constraint thus making it difficult to encompass the opinions of top officials in the organisations. For the future study, larger sample size can contribute in getting a better gist on the training and development practices in the construction sector of UAE and its impact on the overall performance of the employees and the organsiation. For the future research, the research can be beneficial if it is conducted on different departments of the organisations in order to highlight the areas that in the construction sector are in need of advanced training and development techniques. The research study can also be of significance if the study focuses on the gender. This will help in identifying the specific areas that requires more training and development as compared to other areas. Such researches can also lead to the advanced training and development practices in the construction industry.